A slurry tanker built to his own specification has proved an excellent investment for Middletown, Co Armagh, NI dairy farmer George Mitchell. George applied successfully for a Manure Efficiency Technology Scheme (METS) grant and had the tanker built to meet the actual needs of his own family farm. George applied successfully for a METS grant and had the tanker built to meet the actual needs of his own family farm. “This included auto front fill and a rear steer axel plus a high powered vacuum pump to give rapid fill and emptying,” explained George an agricultural graduate from Queen’s University Belfast. “My cousin, who runs an engineering business, made a marvellous job of this special build and I am so please we went for this option rather than buying a standard ‘ off the shelf’ tanker’ that would not do the job for us. “Our tanker has also been fitted with a trailing shoe so now we can get slurry on fast at a high volume without problems such as smell, spray drift or valuable nitrogen being wasted into the air. “Getting slurry on when time, weather, rules and regulations allow is vital and this has been made a lot easier with our new tanker. 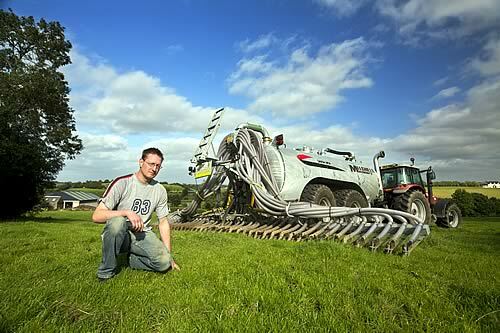 Continuing George suggests other farmers should urgently consider applying for a METS grant. These machines could help make their farms to be more efficient, more environmentally friendly and less dependant on expensive bought in artificial fertiliser. “Making the most of the one crop we can grow better than most of our competitors, grass, has a key role to play in NI Farming PLC remaining competitive.